Bears are strong and can seriously injure people (fortunately for both people and bears, they seldom attack people). Despite attacks by bears being rare, safety around them is still important. People need to know how to behave around bears to help provide for their own safety and to prevent unnecessary deaths of bears. Presented by the Safety in Bear Country Society (in co-operation with the International Association for Bear Research and Management), these videos provide important information to help reduce human injuries and property damage from grizzly and black bears throughout North America while also reducing unnecessary bear deaths. Staying Safe in Bear Country is the main 50-minute video that is a stand-alone educational tool for anyone living, travelling, or working in bear country. 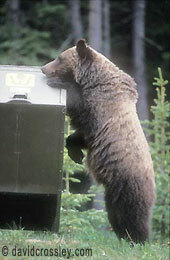 It includes the consensus opinion of leading experts on bear behaviour and its relevance to human safety. People who watch the video will develop a better understanding of bear behaviour and how this knowledge can help them prevent bear encounters and attacks. Working in Bear Country is a 20-minute module to the main video that provides more detailed information specific to people working in bear country. It is especially relevant to industry managers and supervisors responsible for the safety of workers. It is not a stand-alone education video. It is essential for people to be familiar with the content of Staying Safe in Bear Country before viewing Working in Bear Country. The major message of both videos is that a much greater degree of co-existence with bears is possible if people understand and apply a few safety principles. These videos will allow people to appreciate bears and the places where they live. To find out more about bear characteristics and behaviour, bear-human interactions, deterrents, and preventing problems, read Main Messages from Staying Safe in Bear Country video. These three videos were made by Ellis Vision, a well-known, Canadian natural history film and video producer. Each has been shown many times on the Discovery channel, both in Canada and the USA. The three videos each have a common format. Images and commentary showing and explaining the behaviour and ecology of the bear species is interspersed with interviews and analysis of real life incidents where people encountered bears, sometimes leading to injury. In each video Stephen Herrero analyzes and comments on the incidents and how greater safety could be achieved. Produced and sold by Ellis Vision, Toronto, Canada, 1-416-924-2186, email sales@ellisent.com. The standard book reference regarding safety around bears is: Bear Attacks: Their Causes and Avoidance, by Stephen Herrero (2002 edition available). The causes and avoidance of attacks by grizzly (brown) and black bears are examined based on scientific analysis of 414 detailed records of encounters between bears and people. Principles are made real by presenting and analyzing the details of certain attacks and non-injurious interactions. The book was nominated for The Wildlife Societies’ Best Book of the Year Award in 1985. In a 1992 survey of members of the International Association for Bear Research and Management, the book was voted to be “the most important scientific work on bears in the past 25 years.” Over 80,000 copies of the English edition have been sold. German and Japanese translations are also in print. Available in Canada from McLelland and Stewart, and in the USA from Lyons Press. For additional information about bear videos, film productions, or products, go to the Media & Products page. Surprisingly little research has been done specifically addressing bear safety issues. Much of what people think they know about safety around bears is based on assumptions that may or not be correct. In this section we feature research articles that have been published in scientific journals and have been reviewed by peers.